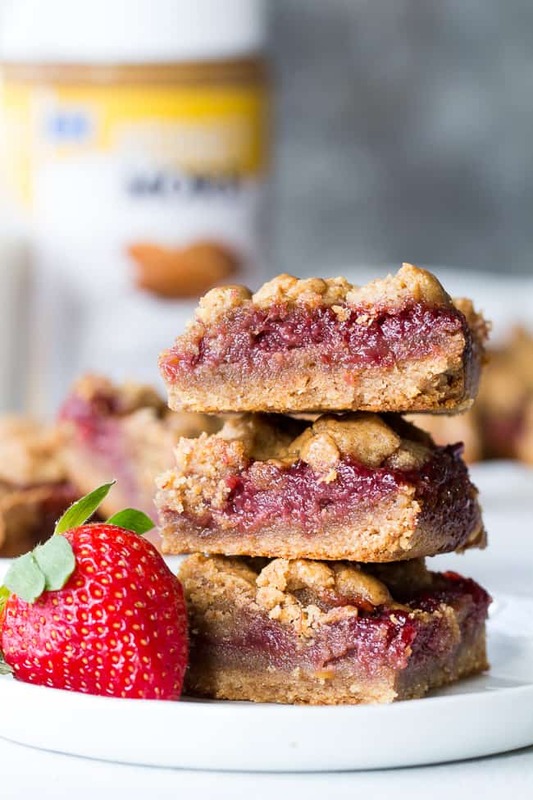 These gooey, sweet, and perfectly chewy Almond Butter and Jelly Cookie Bars are a great treat to have around for a heathy snack or dessert. 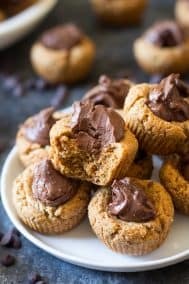 They’re paleo, vegan, gluten-free, easy to make and total comfort food! I’m sure I’ve told you about my ridiculous PB&J streak? Maybe you haven’t heard. No, it’s not about me streaking with PB&J, it’s about the lunch I ate for 5 years straight somewhere between the ages of 19-24. Maybe longer, it’s so hard to remember back that long! But anyway, I know I’ve told this story before, but Adam makes fun of me whenever he gets a chance about that lunch. You see, we worked together, LONG LONG ago, and, I brought an identical sandwich to work every day. The sandwich was – peanut butter (creamy, lots of it) jelly (always strawberry), and sliced bananas. On some sort of multigrain bread, because I was really into “healthy” whole grain bread back in those days. Can you blame me? Saving money and eating the most delicious lunch every invented, I don’t see how any of that is funny in the least. As it turns out – and coming from a formerly addicted PB&J’er, I mean this – you can recreate the flavor and texture of your old favorite sandwich and make it Paleo. Actually, you can make it BETTER. Trust me, it’s true – because here we are turning them into cookie bars, which are better than a sandwich. That old whole grain bread just doesn’t do it for me the way it used to. I had two “challenges” for this recipe. First, I wanted to make them vegan – because why not. I become too reliant on eggs if I don’t make something vegan once in awhile. Second, I NEEDED all 3 of my kids to like these. Because then, I’d know for sure that they legitimately taste like actual non-paleo PB&J. I only had to try twice to get my sweet success! These are similar to traditional cookie bars in that the crust and crumb top are from the same mixture, with the filling in the middle. The jelly is made with just 2 ingredients (strawberries and maple syrup) and seriously – who knew you could make jelly taste like this one with two ingredients?! My kids thought it tasted like candy – not joking. See for yourself! The jelly alone might become a staple for you! As for the almond butter – it’s no ordinary almond butter! 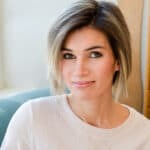 The one I used for my cookie bars is from Naturally More – and it’s MORE than just almond butter (hehe). Their almond butter is all natural and infused with probiotics and flax. Probiotics! How cool is that?! 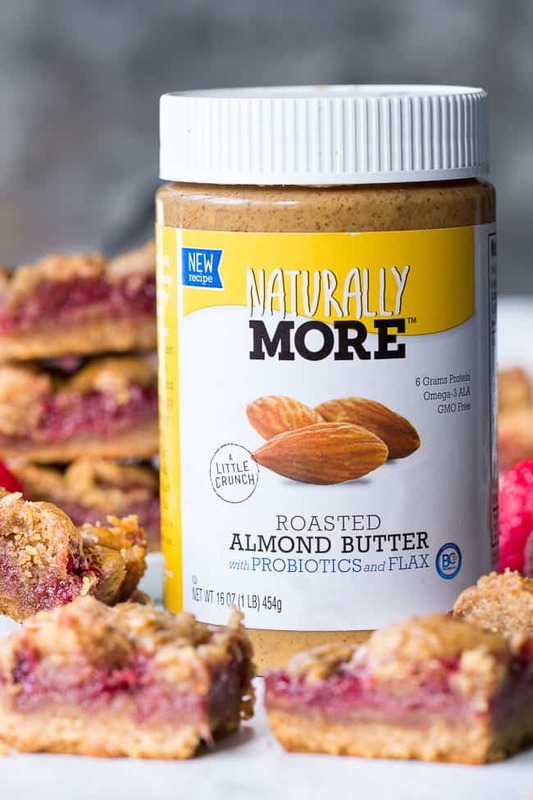 Naturally More is also giving away 2 12oz jars of their crazy delicious roasted almond butter with probiotics and flax to my readers! To win one of them, simply leave a comment in the comments section below and I’ll pick two entries randomly who will receive a free jar. 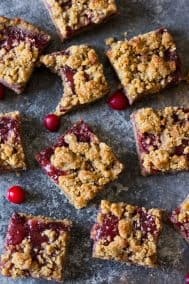 Are you guys ready to make the easiest, most delicious and healthy almond butter and jelly cookie bars? Let’s go bake! 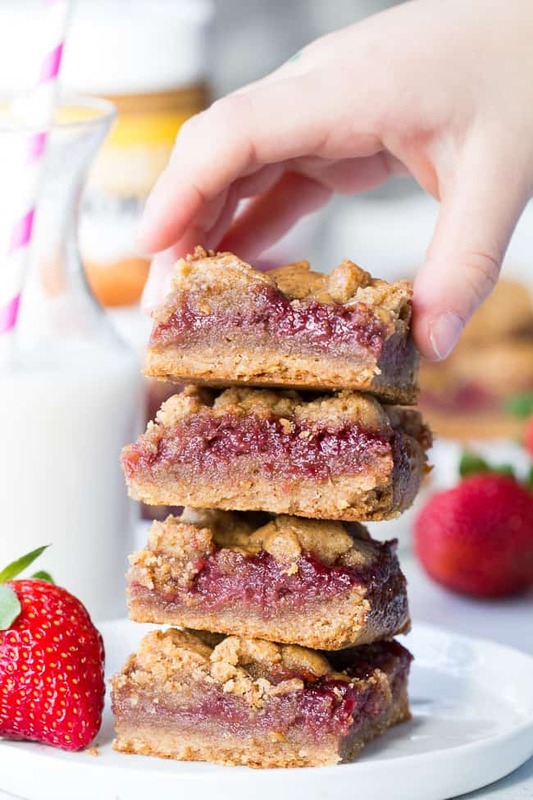 These gooey, sweet, and perfectly chewy Almond Butter and Jelly Cookie Bars are a great treat to have around for a heathy snack or dessert. 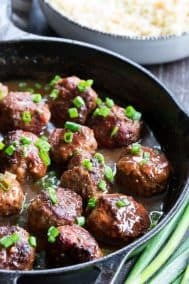 They're paleo, vegan, gluten-free, easy to make and total comfort food! Place strawberries and maple syrup in a saucepan over medium heat and bring to a boil, stirring occasionally to avoid the syrup from burning. Lower the heat to a simmer and cook 20-30 more minutes, stirring and scraping occasionally to prevent burning. Allow the jelly to cool and thicken in the refrigerator while you prepare the crust/topping. Preheat your oven to 350 degrees and line an 8x8" metal baking pan with parchment paper. Press 3/4 of the dough into the prepared baking dish lined with parchment paper. Bake at 350 degrees for 7-8 minutes, then remove from oven. Spread 1 cup of the jelly* over the partially baked crust starting in the middle and working your way out. crumble the remaining chilled dough over the top evenly. Drizzle 2-3 more Tbsp of almond butter over the top as desired, then bake in the preheated oven for 25 more minutes until center is bubbling and top is turning light brown. Allow to cool completely before cutting into squares - you can hill in the fridge to speed up the cooling time - the longer the bars are left to cool the easier they will be to cut into neat squares. Store leftovers covered in the refrigerator for up to one week. Enjoy! Want more Paleo bar recipes? Try one of these! Did you have a PB&J streak like I did? What’s your current nut butter crush? Haha minus the bread, I should do that more often! Here in Montana, we don’t have Trader Joe’s and it’s selection of nut butters so almond butter is my go to! And I love it! I totally relate to your years of PB&J’s! I don’t even want to say how many years my stint lasted but it was awhile. Can’t wait to try these! I need to make these asap! That jelly looks and sounds SO AMAZING! Oh I have been searching for a way to make a healthy ‘jelly’ can’t wait to try these! You will definitely love this jelly! I used to bring a peanut butter on whole grain sandwich for lunch every day in high school, so definitely agree with you THE BEST LUNCH!! I however was not a jelly fan until a couple years ago, but now I love making my own with leftover fruit, no food waste here! Love having some PB or almond butter & jelly on a protein waffle or Trader Joe’s cinnamon raisin gluten free bread. Can’t wait to make these!! I love almond butter and I am currently doing my second Whole30. The probiotics definitely “take the cake”. These look delicious. I am always on the lookout for yummy desserts that are gluten free. I can’t wait to try them! After your Whole30 for sure! Hi MICHELE! I’m new to your blog & Instagram page but absolutely love what I see so far. This recipient will be perfect for my husbands birthday celebration. He follows a gluten free diet and is allergic to peanuts, so I know he’ll love the Naturally More Almond Butter. Oh I really hope you like it! Pb&j was literally my jam for years!!! Your post brought back memories!! Always looking for something sweet to try so will be making these this weekend for sure!!! Ooh I hope you like them! 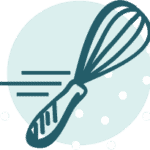 I’m pretty new to your site but already I love the ease of your recipes! 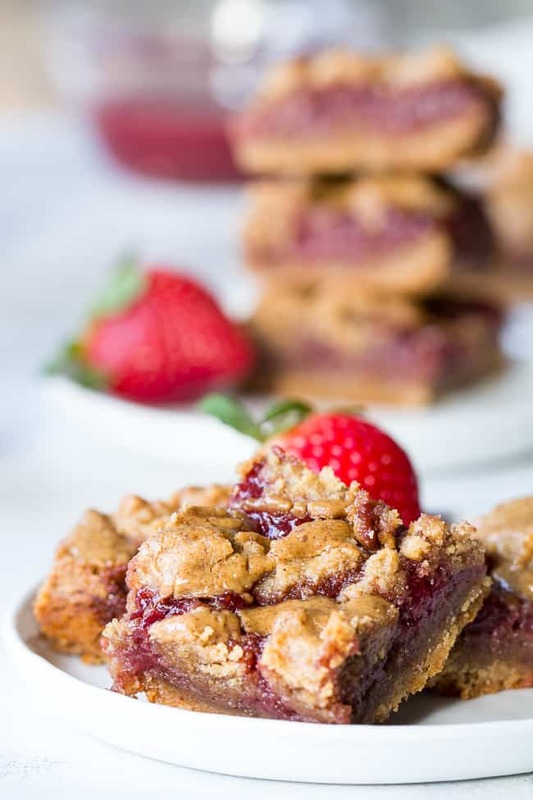 These almond butter and jelly bars sound divine and trying this almond butter would be amazing! I will definitely make these soon but I see ice cream as a good addition ? Ice cream would be perfect, can’t go wrong 🙂 And so glad you’re enjoying the blog/recipes! 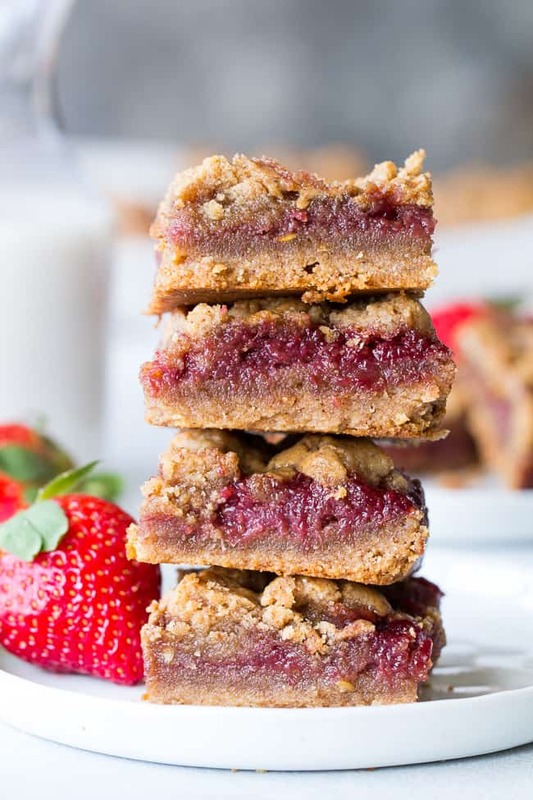 Cookie bars have to be some of my most favorite desserts; I LOVE the crumble on top; I love the jelly part, and I love that you also put almond butter with it. They are so tasty looking. One for breakfast sounds good. 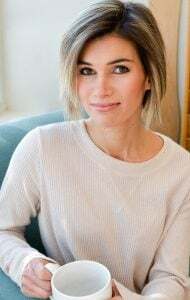 Lived on pb&j on whole wheat when I was pregnant with my sons. Would wake up and make one in the middle of the night for months…… looking forward to tryin these with raspberries!! This Naturally More Almond Butter sounds amazing. I am going to make this recipe and will definitely buy this product. I would love to get a free jar but win or not, this is a mist try product. Thanks for bringing it to my attention! I’m excited to make these Michelle! Think I could use an unsweetened strawberry jam/preserves instead of making it? Just trying to get it done quicker. Thank you for keeping our sweet tooth and tummy happy. I’m on the streak right now! ha! for years I wouldn’t touch jelly so I usually only hade peanut butter on my sandwich but now I add it. these look delish! Jelly is way too good to skip! These look amazing, I love blueberry jam, could I swap out the strawberries for blueberries? You are KILLING me right now…….I wish I could just reach through my screen and eat 5 or 6 of these! Seriously, these look absolutely amazing. I’m excited to try them. Just hope I can find all of the ingredients. My usual go to nut butter is peanut butter, but lately I have been using almond butter a lot. This may sound weird, but my favorite sandwich as a kid (and still is) is a peanut butter and chocolate sandwich. PB& chocolate is pretty awesome, not weird, VERY smart! You’re making me wish I didn’t just start a whole30! These are a must try for after. My twin toddlers would be all over these! Plenty of good Whole30 recipes too, lol 🙂 There will be plenty of time after! These look delicious! I made your blueberry bars the other day for my kids as an afterschool snack. They loved them! Thank you for these great recipes. I’m so thrilled they liked them! Yay! Ok! Super excited to make these with my toddler. Just yesterday, i was explaining to her what “jam” is. Good timing on this recipe. Yay! I randomly stumbled on to your site today, and I’m glad I did! My family LOVES pb&j!! Either way, I’m looking forward to trying this recipe. And if it must remain only a sometimes treat, then so be it. I have a feeling I’m gonna love it either way. I definitely think you could try it out! You could reduce the sweetener by half and see what happens, let me know! Oh my goodness I have to try this! I have never heard of this brand and I cant wait to try this! I am like a serious almond butter addict! I have a very limited diet and almond butter is one of few things I enjoy! I eat it any time I can especially with bananas! I would love to win this so I can give it a try! This looks amazing! Thank you so much for the recipe! I’ve never heard of this brand of almond butter before, but it sounds really good and I’ll have to give it a try. It would be awesome to win one of the free jars you are giving away – thank you for that option! Can’t wait to try this recipe as I really miss eating my PB&J sandwiches!! It was a staple in my house growing up! I absolutely love Almond Butter and can’t wait to try this brand. I haven’t tested it but I don’t see why not. Thank you! PB&J might really be my ultimate sweet comfort food! I used Costco’s organic almond butter any my own strawberry jam sweetened with a concentrated organic apple sweetner. I threw some dried chopped mulberries on top after they were just taken out of the oven, pressing them in slightly. They added a little more crunch and texture. I am making them again today as organic strawberries are cheap right now. Going to sub the maple syrup with date syrup to make them entire fruit sweetened and am going to freeze half a batch to see how they are after being frozen! 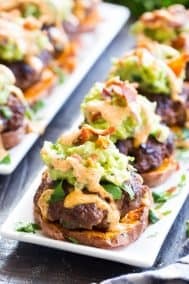 Even my paleo hating parents loved these!! Ooh that sounds so good! Love it when the paleo “haters” love the recipes!! I’m making the bars right now because they look so delicious and not too unhealthy but my “crumb” mixture is not very crumby or doughy. It’s more liquid. I’m using Kirklands Almond Butter. Should I add more almond flour? Or Flax meal since your almond butter has flax in it and may be thicker then mine? Did you already add the coconut flour? The coconut flour is so dense and typically gives it more body and crumble. If so, I’d add a tbsp at a time of almond flour, giving it a minute to absorb. You want the mixture like a dough. Thanks for the quick response! I did add the coconut flour already and still too moist I think. It’s more runny then a dough. I’ll try adding a little more almond flour. Hopefully that helps. Thanks! I’m super excited to try this recipe. 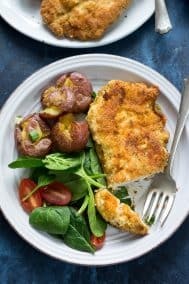 Can I use only almond flour or do I have to include the coconut flour. One of my favorite snacks had been pb&j on sliced banana forever! I’m thinking you’d have to use a total of 1 and 3/4 cups almond flour in order to omit the coconut flour, but I’m not completely sure. Coconut flour is so dense that 1/4 cup goes a long way! Have you tried adding chopped walnuts or almonds to this recipe? 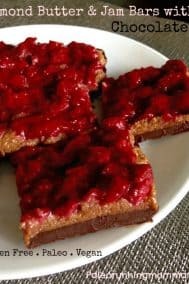 Omg I have never written a comment about a recipe on the internet before (although I have made many paleo/gf internet recipes) but I am so inspired by the deliciousness of these bars that I had to write! Thank you! Wonderful recipe. I used raspberry and they are da bomb. Hi Michele! These look amazing bc and I plan on making them today! Do you know if the pure maple syrup could be swapped out for honey or stevia? Thanks for the recipe! Hi! I think honey would be fine, not sure about stevia since I haven’t worked with it. Hope you like it! These look delicious and easy to make! We love celery and almond butter as a snack. I am so excited to try these. I just started Paleo and go to my pantry and see peanut butter and jelly sandwhiches! And, no, they are not there. 🙂 I found your recipe on a link through Dr. Axe and I feel like there is hope. I cannot wait to continue on this journey with husband and two children now. Thank you and I look forward to receiving more recipes from you. Update – I made the bars after ordering the Naturally More almond butter! BTW… I got a nice discount for my first order 🙂 My sister and I absolutely loved them, my kids and my husband liked them, as for my six year old grandson, lets just say it was a new experience. The bars were everything and more what I was hoping for. Great job on this recipe. I am enjoying this Paleo way and it is nice to see I can have everything I did before. These look delicious! I really want to make them but I only have regular wheat flour on hand. Can I replace that for the almond and coconut? And if yes, would the amount be different. These will soon become a staple for me! I miss PB&J since starting paleo! 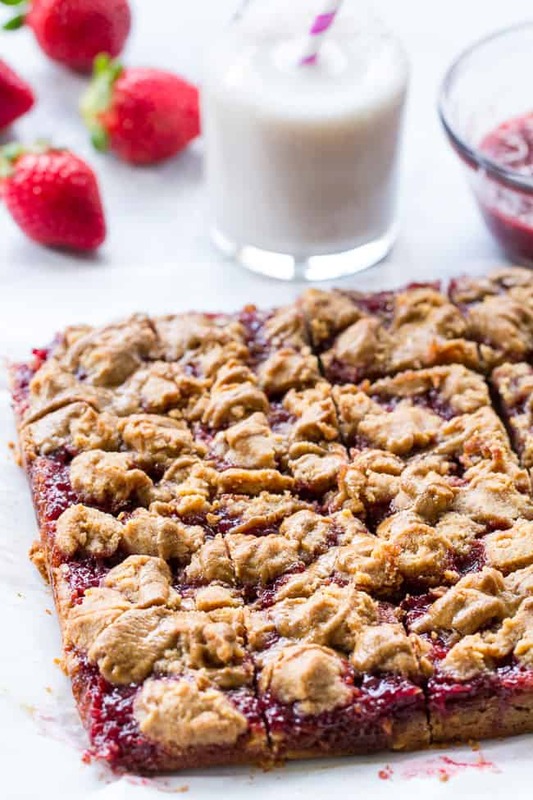 These Nut butter and jelly cookie bars sound delicious!! I am going to give them a try next!! I just got fresh strawberries from my CSA yesterday so I am ready to go!! Really hope you guys like them! These look delicious! My only question is, how messy are they? Are they easy to pick up and eat with your hands, or would they crumble everywhere if you tried that? I’d like to make them for a meeting, but we wouldn’t have plates or forks or anything but napkins. Do you think they’d be too gooey or crumbly for people to easily handle? 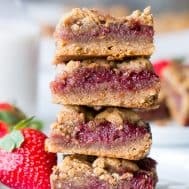 I think my coworkers would love these, I just don’t want to bring a treat that results in everyone getting almond butter and jelly all over their nice clothes. 🙂 Thanks! I’ve found that if they’re not chilled they can get crumbly, but right out of the fridge they “stick” a whole lot better 🙂 Hope this helps! Oh my! I’m a soon to be 35 year old who can eat PB+J in a bowl with a spoon. Because that’s what an adult does, right? I HAVE to make these! I would love a jar of Naturally More Almond Butter! Can they ship to France?! I’ll be making these bars ASAP. I showed my bf the recipe immediately and now both of our mouths are watering …. These sound amazing and I can’t wait to try them and the almond butter. I cant believe I haven’t heard about this yet! Oh my goodness! Can’t wait to try! I used to make double decker Pb and j everyday for lunch in high school! Bahaha! They were so good! I forgot how much i loved those! Thanks! Yum! I think you’ll love these then! Making these tonight! Do you know if anyone has had success with freezing them? We have a few too many paleo baked treats in the fridge right now but I seriously can’t wait to try these. Hi Michelle. I just had to comment on the pictures. They ate beautiful. I haven’t tried the cookies yet but I enjoy photography also and the pictures are eye candy. Great job! I plan to use raw almonds. Toasting makes them acidic. Why would you want the nuts to be acidic when the body is alkaline/neutral? can I sub coconut flour for cassava ? I have made at least 4 times in the past month or two. Everyone loves them. Can’t wait to make these! My husband and I started a Paleo “lifestyle” January 1st. My husband had lost over 20 lbs and I have lost 16. All thanks to you! So glad I found your blog. 95% of what I’m cooking has come from here. It’s made it very easy! Thank you!! Looks so good… I’m right there with you on PB and J! My next paleo baking endeavor!! Can’t wait to try them. Oh my goodness, these sound AMAZING! I do a lot of baking for a family with food allergies. I’m going to try and substitute sunflower seed butter and GF flour to see how it works out. I’ll let you know! I can’t wait to make these after Passover. 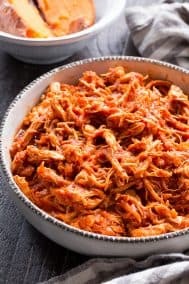 Thanks for this delicious recipe which will be sure to satisfy my PB cravings. Why not make these even healthier by using a maple syrup substitute made with natural sweetener? Lakanto makes one with monk fruit sweetener that is nearly carb-free. Pure maple syrup is super sugary and full of simple carbs. This is awesome! I love paleo but I too am a PB and J enthusiast from way back. I can’t wait to try this out!!! Since I don’t think I’ve ever seen that almond butter locally. Would love the chance to try it!! Amazing… can’t wait to try! 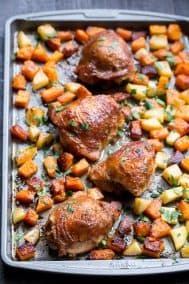 I am going to try this recipe looks so good! Can’t wait to make these!! Love pb&j but haven’t had one in almost a year since going paleo. They look heavenly! !